What Android emulator should I install on my PC? We’re all about Windows 10 Mobile here, but the fact is that a lot more users use Android. However, a lot of Android users are also using Windows 10-powered computers, so we’re going to combine these two things, and present you the best Android emulators for your Windows PC you can find. 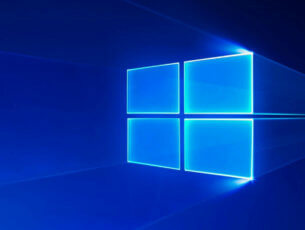 Although the title of the article says Windows 10, because that’s the most used OS by our readers, all these Android emulators will work for other Windows versions that you might be running, such as Windows XP, Windows 7 and Windows Vista. As usually, the 1st position is the one we suggest as being with the most features, but feel free to examine all your options. 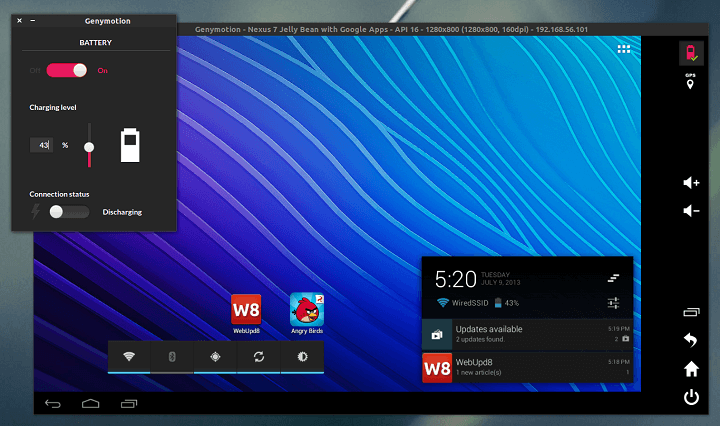 What is the best Android emulator for Windows? Bluestacks is definitely the most famous Android emulator (founded 8 years ago) on our list, and it is also the most widely used Android. And rightfully so. It is totally free and after several tests, we concluded that this is the best Android emulator for Windows XP, Windows 7, Windows 8/8.1 or Windows 10. BlueStacks runs 97% of what’s inside the Google Play Store on your Windows PC, as long as you run Windows XP or later. It is the single Android App Player that we recommend to virtualize the full Android experience as a Windows software without any harm to your system. 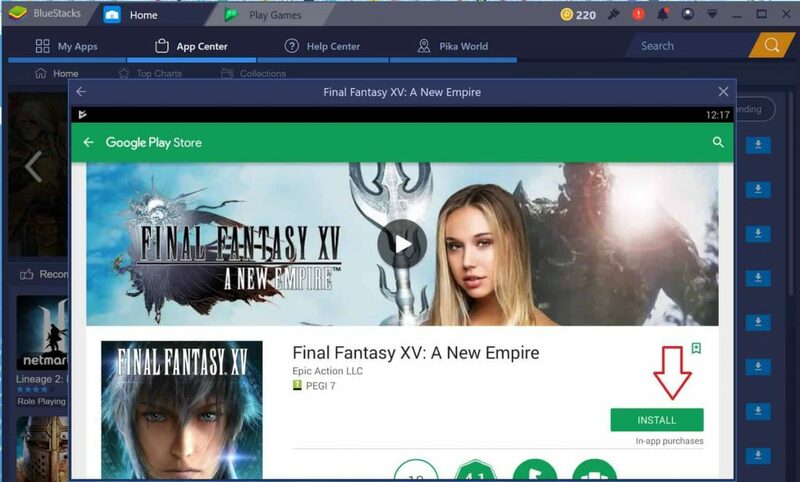 In general, Bluestacks is the best for playing Android games on their computers, but it’s okay for other purposes, as well. Also, it’s very simple to use, so even if you’re not an ‘advanced’ user, you’ll do good with this emulator. 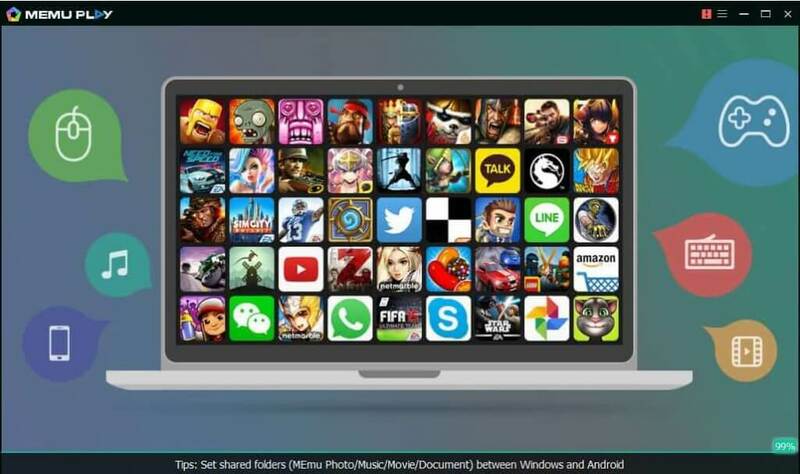 Unlike others, BlueStacks 3.0 allows you to run multiple Android Apps and Games simultaneously. 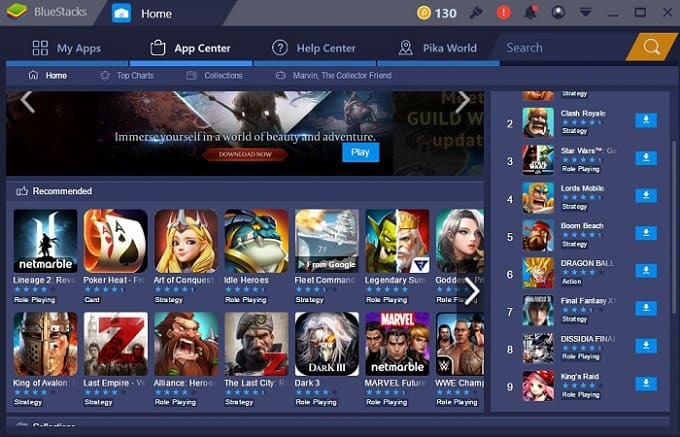 Furthermore, the most recent update – BlueStacks + N Beta, represents the first and only Android gaming platform to have Android 7 while the majority of other Android emulators run Android 4.4. This means you will use an upgraded graphics engine, making your games faster and better looking. And this is exactly why BlueStacks is our single and most honest recommendation. Make sure to download the associated game, as showed in the screenshot below, in order to get bonus Pika points. You will be able to use them for special features and products. Once the link opens, you will get a ‘Download the Bla Bla Bla game’. When you click on it, Bluestacks automatically downloads and you can proceed from there. 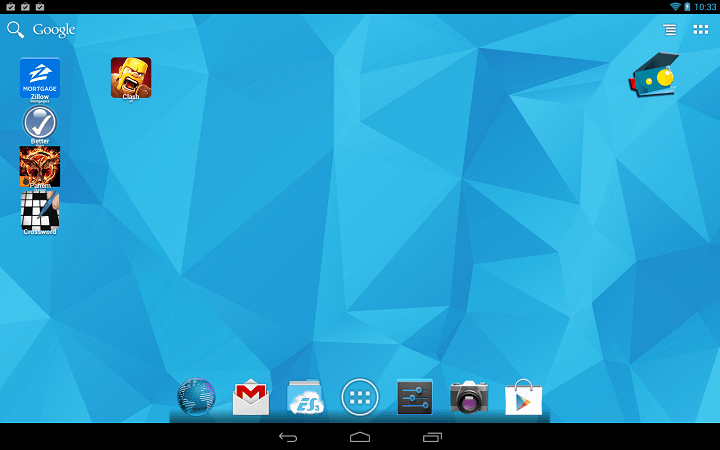 Nox is another fairly good Android emulator for playing Android games on your PC. To complete the gaming experience, Nox offers some additional utilities and additions, such as the support for computer’s keyboard and mouse, as well as the gamepad. It could be laggy sometimes, but the overall impression is satisfying. Another good thing is that it doesn’t come with any additional software. 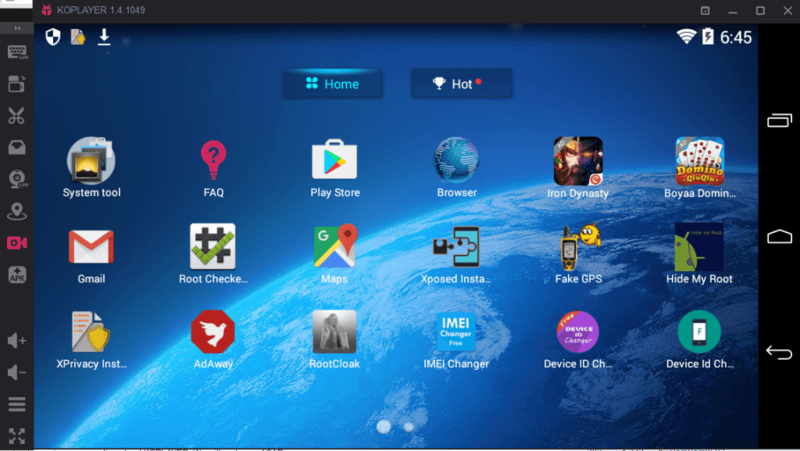 MeMu is a great Android emulator that has created for one purpose only – gaming. Supporting both AMD and Intel chipsets, this tool will run on every computer. It also supports KitKat, Lollipop and Android Jelly Bean. This makes it extremely powerful and puts it in a good position. 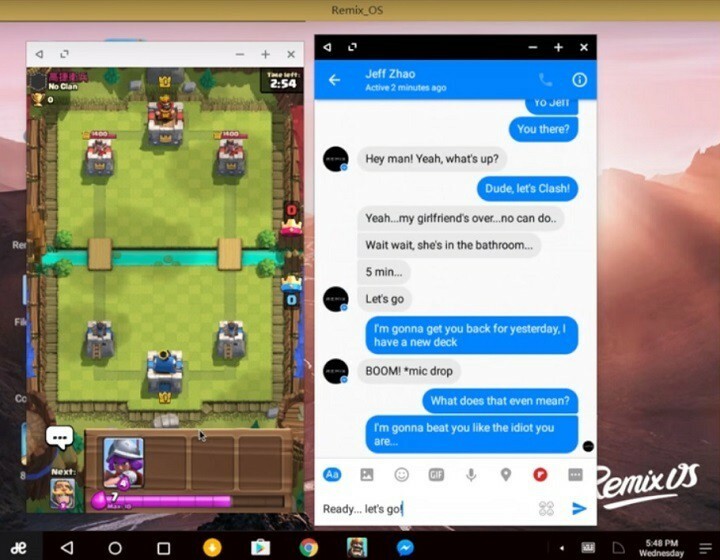 Remix OS Player is the newest Android emulator for Windows PC and the only one that allows users to play multiple games at the same time. Thanks to this tool, you can run Android apps and games in multiple windows on your PC, and chat with other gamers at the same time. Remix OS Player is based on Android Marshmallow which means you can enjoy the latest apps and games Android has to offer. Remix OS Player is completely free, it’s free to download, free to play, and free to update. This emulator comes as an exe.file, which makes its installation very simple. You can download Remix OS Player for free from Jide Technology. Droid4x is a relatively new Android emulator on the market, but that doesn’t decrease its value, as it’s one of the best choices for simulating Android on your computer. And there are even some nice improvements, since the first version. One of the most interesting things about this emulator, are add-ons, which make this emulator even more useful. It comes with a pre-installed Google Play Store, and also beats competition in gaming, although some better options in terms of stability. Another great feature is an app which you can install on your Android phone, so you can control games on your computer. 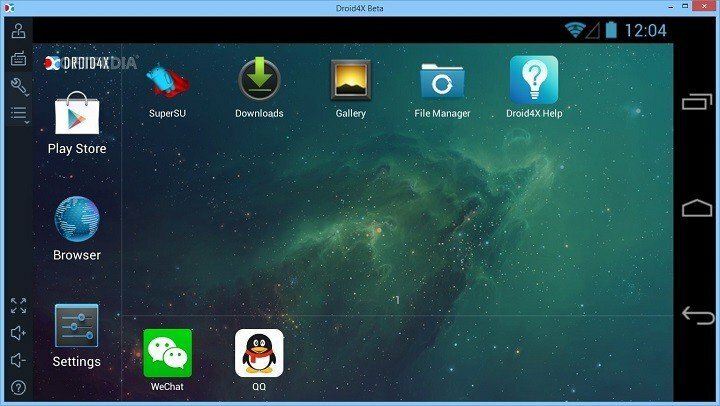 Use this free Android emulator for your Windows PC with confidence. You can download Droid4x for free, from this link. 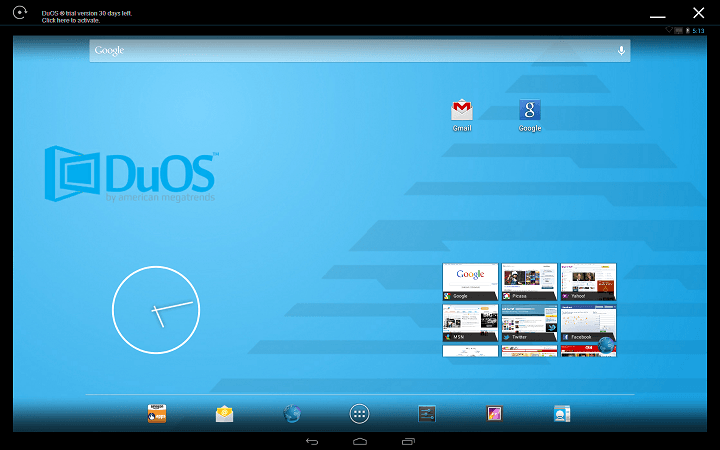 AMIDuOS is also a great Android emulator, it even comes in two versions, one running Android Lollipop, and the other one powered by Jelly Bean. But using AMIDuOS comes with a price, as the Lolipop version costs $15, while the Jelly Bean version costs $10. AmiDuOS will work exceptionally well on your computer, and it is good for variety of tasks, from productivity to gaming. However, this emulator is not so good for developers, as it doesn’t give you device-specific configurations, but for regular users, it’s a very good choice, if you want to pay for an Android emulator, of course. Download AMIDuOS from this link. UPDATE: AMIDuOS is now free for all users. 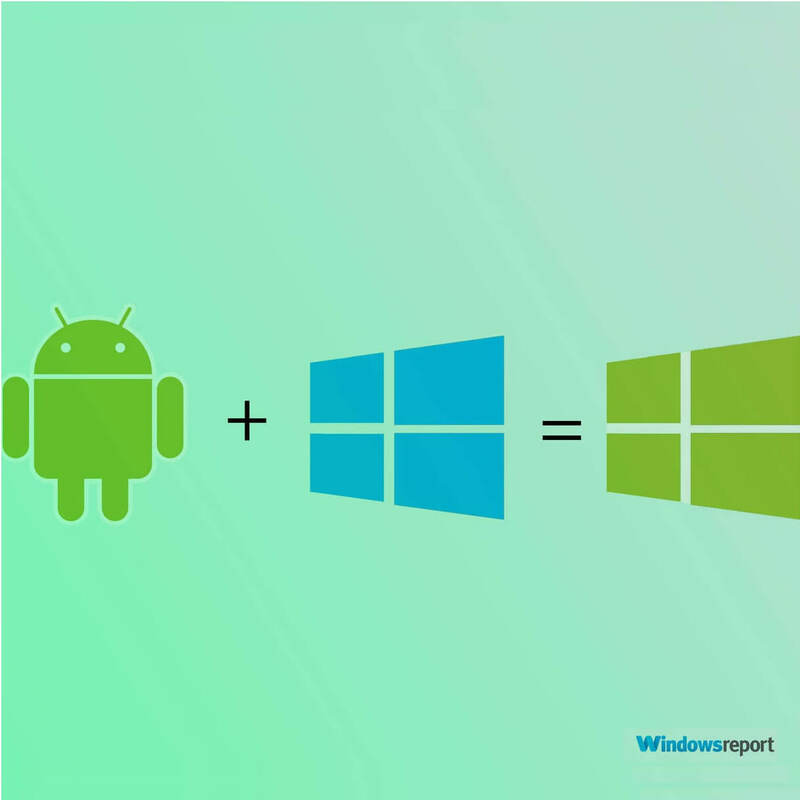 Yes, this means that you can bring all the Android functionalities to your Windows computer at no cost at all. Windroy works like any other regular Android emulator on this list, but it has something unique, it completely runs using the Windows kernel. Windroy is perhaps the simples emulator to use on this list,because of its lightweight design. 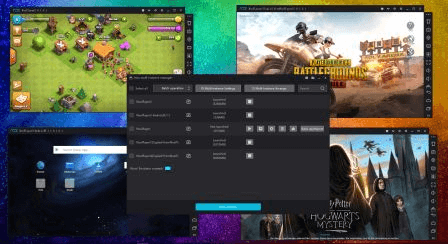 As we pointed out, apps and games work well on Windory, so if you want a handy, simple to use Android emulator on your Windows PC, you definitely will take Windroy into consideration. It also fully supports Play Store. You can download Windroy for free from this link. And now something for developers! Genymotion is absolutely the best Android emulator you can get, if you’re into developing Android games on your computer. It emulates apps and games on a variety of Android devices, without requiring you to own that device. Also, besides choosing the device Genymotion will ‘act’ as, you can also set up various versions of Android, so you can experience how apps and games work in different environment. You can, as well, easily switch between devices, by your desire. Genymotion is something like the oppsite of AMIDuOS, because it’s great for developers, but not so great for regular users. You can get Genymotion from this link. 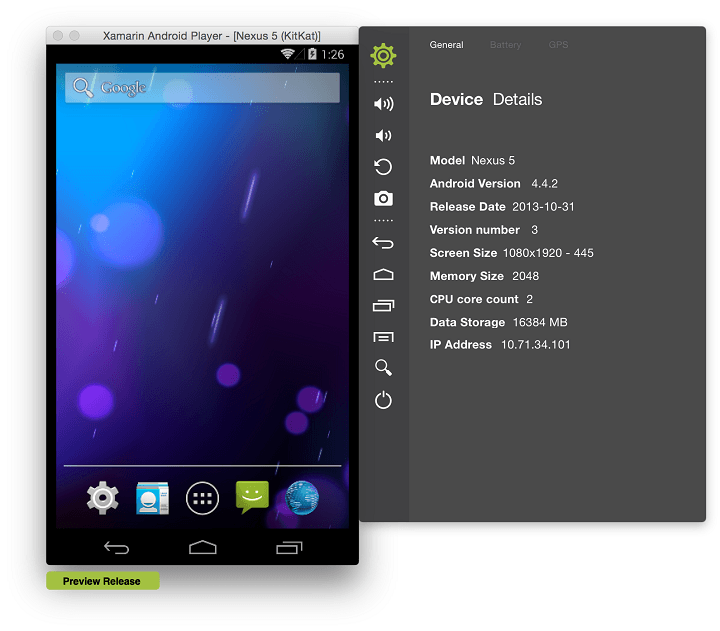 Xamarin Android Player is probably the least known Android emulator on our list, but that doesn’t mean it’s not good. It actually runs well on your PC, and as some tests show, it’s almost completely bugless. This emulator is completely compatible with Windows 7,8, 8.1 and 10, so you don’t have to worry about that. Like Genymotion, Xamarin is also mainly focused to developers, offering a simple user experience. Xamarin is completely free to download, but like some other emulators on this list, it requires VirtualBox to be installed on your computer. You can download a 32-bit version of Xamarin Android player for free, from here, and a 64-bit version from here. Andy is a relatively new Android emulator for Windows PC users, but it’s one that, as you can see, we suggest for you to try (download will start automatically). It used to be a little buggy when it first came out, but most of the issues have been fixed since then. It is also good for a variety of tasks, but unlike Bluestacks, while it installs stuff on your Windows PC, we tested it ourselves and we saw that they partner with decent, if not impressive companies (in our case, it was Opera). Andy supports some unique features that are not supported by all Android emulators out there, like remotely playing games on your computer from a mobile phone, ARM support, and the ability to directly install apps, using your desktop browser. Also, you might want to wait a bit for the install to compete. And an important thing to consider, if something isn’t clear, feel free to go over this extensive FAQ provided in order to make sure you get the right assistance. 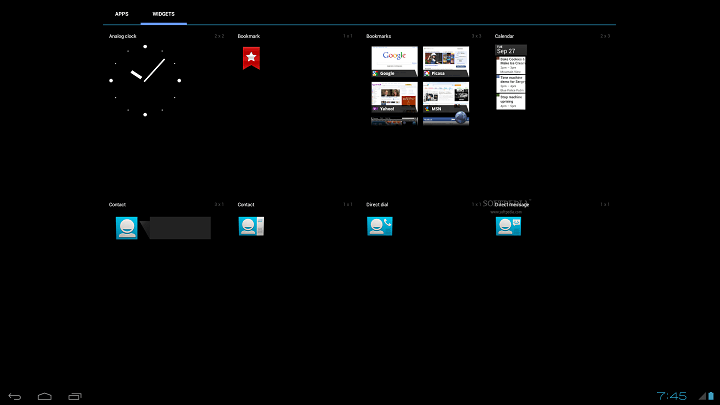 Andy is an Android emulator for Windows PC completely free of charge, and you can download it from the link from below. UPDATE: Andy no longer supports 32-bit machines. So, you own one such machine, download another emulator from this list. Koplayer is a well-rated app that is totally free and lets you open all the apps from Google store. This emulator uses a brand new x86 Kernel technology that should make it faster,r better and more compatible than any other emulators. Koplayer is compatible with Windows 7, 8/8.1 and 10. The game supports gamepad, mouse, and keyboard so your gaming sessions could be more pleasant. It also offers you some interesting features for camera, keyboard, and microphone. That lets you record your gaming sessions, make screenshots and share it with your friends. You can try it and let us know in the comments section how does it work. We’ll end our list here. As you can see, there are a lot of useful Android emulators for Windows out there, which is a great improvement over a few years’ periods. You basically can choose the right emulator, based on your needs, skill level, and desires, which is great. Also, if you’re using an iPhone or iPad, we also recommend checking out the best 5 emulators to run iOS on your Windows PC. What’s your favorite Android emulator to use on your Windows 10 computer? Or you maybe know some quality emulator that we didn’t list here? Tell us in the comments. Editor’s Note: This post was originally published in January 2016 and has been since revamped and updated for freshness, accuracy, and comprehensiveness.